PardesiLink Blog | 7 Most Popular Gujarati Foods Which Will Make Your Taste Buds Happy!! ‘Gujratis’ the name itself speaks about the people. A cast that loves to travel and eat. They are present at probably every city in the world, a unique thing about them is they carry their culture with them and one of the most important part of their culture is their food. That may be the reason for every well-known hotel or restaurant in India has gujrati cuisine on their menu. There are around hundreds of gujrati dishes but what are those spectacular things that you don’t want to miss out. We personally went out, tasted each of them hereby bring you the most tastiest of them. Here are the 7 Gujrati foods that will instantly water your mouth. Dhokla symbolizes Gujarat itself and people of Gujarat are also termed as dhokla lovers. Dhokla is made of split chickpeas and fermented rice. They come in different varietiesÂ ranging fromÂ color to techniques used to make them. Dhokla can be of yellow, white, and even sandwich color and can be steamed or fried. This dish is something that you definitely don’t want toÂ miss out. A dish that can be enjoyed at any time, breakfast, lunch, snacks, or dinner, you can enjoy it’s taste without looking at the clock. Specially designed cookers are available for making handva as it cannot be made in normal cookers. Guard, peas, garlic, ginger, green chillies and coriander are the ingredients used to make handva and is best tasted with mango pickle. A dish so rich of ingredients that it is not even possible to name them all without going to the next page.Â This dish was specially created for the famous kite festival ‘Uttarayan’, but that doesn’t mean you can’t have it whenever you want. Made of every possibly known vegetables to humans,Â with dry fruits dipped in oil. An item often mistaken for paratha, are mostly made of wheat, spices and Green leafy Fenugreek mixed well in dough. Thepla are one of the mandatory items needed by any Gujarati for traveling. Best tasted with pickle and other Indian curries. A dish that is as healthy and as simple as it can be. This dish can be made in 2 mins and is only real competition to Maggi and for some reason preferred over maggi in Gujarat. A curry of tomato and onion with delightful taste of coriander and deep fried sev as garnish makes you tempt for it, more and more. A liquid dish generally used instead of Indian dal. Kadhi is off white in color and hasÂ a little yellow touch to it. This delicious dish is made with butter milk, gram flour/maize flour, ginger, green chillies, garlic, black pepper, clove, yogurt asafoetida and dry Fenugreek. 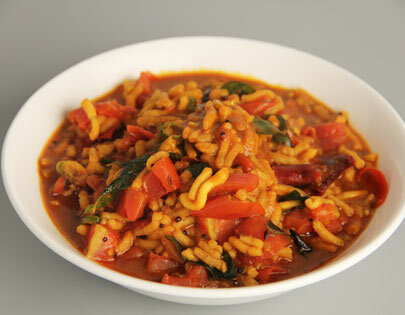 It is super tasty when served with khichdi, but also taste great with rice, chapati, and rice. A street food, with over a billion fan following. This is no ordinary food, as it can fill your stomach to such an extent that you will literally feel cramps in your stomach. Originated from Vadodara but can be found in almost all the cities of Gujrat. Also one of the spiciest dish of India, is made form dry peas, oil fried chilly, garlic paste, and is served with pav/bread. It is extremely famous with youngsters and would definitely leave a peppery taste to your tongue! Hope you all will get the opportunity to try all/any of these, trust me you will just love every bite of it.